MANY areas of Shetland have now been visited by a roadshow aimed at preventing falls in the elderly – a scheme that promises safety, reduced NHS bills and, maybe most important, a bit of fun for participants. Falls prevention co-ordinator Shelley Sandison and her colleagues Elaine Campbell and Elsbeth Clark headed a trial at the Nordalea care home in 2016 and quickly led to Shelley’s employment in a post set up under the auspices of the Integration Joint Board. Shelly is now touring the rest of Shetland with the eight-week programme that is intended to instruct the over-65s as well as improve their strength and balance – thus preventing falls, which are often particularly nasty for the elderly. According to statistics one in three people over the age of 65 will fall each year, with half of those falling again within six months. 10 to 25 per cent will sustain a serious injury. Astonishingly, injury as a result of a fall is the leading cause of death in those over 75 and costs the NHS £2.3 billion per year. A report on the Unst pilot says it “evaluated extremely well” with all the participants showing improved muscle strength, balance, confidence and improved exercise tolerance. 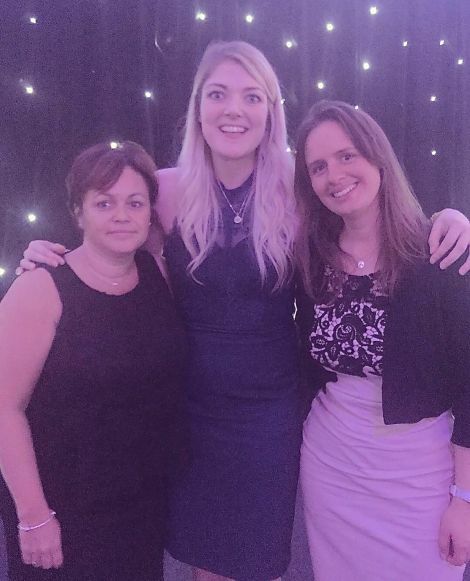 Elaine Campbell, Shelley Sandison and Elsbeth Clark at the Scottish Health Award. Shelley said: “Elaine and Elsbeth had a big part in initially setting up the project. Together with the other parties they got the pilot programme set up in Unst. Without them and all the other people involved in the project from community members, third sector, the NHS and Sheltand Islands Council, I wouldn’t have my falls prevention coordinator post and be running these falls prevention programmes throughout Shetland. She added that a lot of effort had gone into getting the message across to potential participants through nurses, carers, therapists, social workers and doctors, with the aim to involve as many as possible. The falls prevention team were finalists at the 2018 Scottish Health Awards under the Integrated Care For Older People category. Since the Unst trial the programme has been streamlined and Yell was chosen for the second unrolling of the “Otago and more” programme – named from Otago in New Zealand, where it was originally developed. One of the reasons Yell was chosen was that the health centre completed yearly reviews on all adults over the age of 70 – making the identification process easier. A third sector group run by carers, “stepping out” had also expressed interest. In Yell alone 84 patients were identified who would be suitable for the programme. Of these 27 agreed to take part, 18 declined, two were “maybes”, three were medically unfit, three didn’t reply and 31 patients, mainly in a “more mobile” category or not on the nurses’ list, weren’t contacted as the programme would have been oversubscribed. Prior to the Yell sessions, a multi agency meeting was held at the local care centre with senior carers/managers, community nurses, health centre manager and carers from daycare/stepping out group. All aspects of implementing the programme were discussed. Participants were then assessed, including a physical ability assessment, before being are graded according to their degree of frailty or mobility and allocated to a group. Classes are usually held in small groups in local care centres or halls with Shelley and trained carers leading normally 10 or so folk in simple, low impact, exercises that often can be done sitting or leaning on the back of a chair. Carers have also been involved taking people who are living independently to community halls, or wherever the classes are held. According to Shelley, follow up studies in Otago have shown the falls prevention programme has been very effective at reducing falls in the elderly and brings a range of social and mental health benefits, with people getting the chance to meet and maybe see people they have not seen for years. The programme aims at a number of outcomes. The cup of tea follows each of the eight sessions, which are also attended by a specialist who may be an optician, podiatrist, occupational therapist or from another sector – each able to add to the knowledge and wellbeing of the patients and how they can prevent themselves suffering a fall. Talks given by Karen Eunson of Citizen’s Advice has also been useful in alerting elderly people to their entitlements and giving them energy advice. Otago programme handbooks are also given to the participants who were also instructed how to safely continue the exercises at home – in line with evidence that will yield the best outcome. Once the eight weeks are over, the patients are re-assessed with most showing an improvement in confidence and physical ability. Those who did not improve had developed joint pains that were not related to the Otago sessions. After the free sessions are over, attendees can still continue their exercises at leisure centres as Shetland Recreational Trust has trained 15 members of staff from all the local leisure centres to become Otago exercise programme leaders. These sessions cost £3.40, and again include a cup of tea. Some of the care centre residents were not fit enough to attend the leisure centres and have had tailored booklets for supervised home exercise drawn up by Shelley. After the successful North Isles roll-outs, Shelley and the team held another two eight-week programmes in Lerwick as well as in Whalsay and Scalloway, with one to be held next in Brae. It is planned to hold subsequent sessions in the West Side and South End.